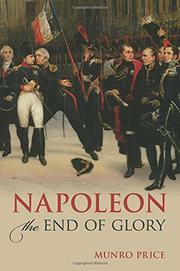 An exploration of the years between Napoleon’s invasion of Russia and his exile to Elbe. As Price (Modern European History/Bradford Univ. ; The Perilous Crown: France Between Revolutions, 1814-1848, 2007, etc.) demonstrates, Waterloo was no more than an anticlimax to Napoleon’s career; it really ended when he left for Elbe. Ultimately, he was undone by confusing troop movements, too many generals leading lots of different armies and a complex assortment of politicians, czars, kings and other leaders. Just about everyone in Europe was involved in trying to defeat Napoleon after his Russian debacle. The author clearly examines their varied objectives, from the restoration of the Bourbons to installation of a puppet government to regency led by Marie Louise, Napoleon’s wife and the daughter of the Austrian leader, Francis II. Some readers will have difficulty deciphering the maps, following the numerous different armies in battles and recognizing the constantly changing players—the biggest of which was Klemens von Metternich, who offered mediation after the Russian retreat. Price questions his motives, wondering whether he truly wanted peace or was laying a trap for Napoleon, who feared succumbing to a dishonorable peace, which he felt would cause the French to rise in revolt. His bête noire was being attacked by the mobs of Paris, and he famously said of public opinion, it “is an invisible, mysterious power that nothing can resist; nothing could be more changeable…but it never lies.” Napoleon’s frequent reports from Paris were expressly designed to keep tabs on opinion, but he often failed to listen. Taxation, conscription, censorship and the collapse of trade turned the people against him. A useful addition to Napoleonic history, but readers well versed in that history will follow the battles and diplomatic machinations better than those with a narrower scope of historical and geographical knowledge.